Temple Grafton lies on the ridge north of the River Avon and the parish includes the hamlet of Ardens Grafton. The parish was mentioned in the Doomsday Book of 1086 as being owned by a man named Gilbert and it covered an area of 600 acres and with a population of around 80. The longest ownership of The Manor House was by the Sheldon family who held it from 1548 to 1675. Grafton Court now stands on the site. During the reign of Edward III in 1347 the village was recorded as Grafton Superior, while the neighbouring Ardens Grafton was named Ardens Inferior. Temple Grafton owes much to James William Carlisle, who in 1875 replaced the old church with the present building. He also demolished The Manor House to build Grafton Court together with the Vicarage, the school and most of the older cottages in the village. The parish church is dedicated to St. Andrews and dates from 1875 and is an attractive example of Victorian church architecture, the work of Frederick Preedy (who also designed the stained glass, including the east and west windows). The south west spire is particularly distinctive with its timber-framed belfry. The present church replaced a much humbler medieval building, originally built by the Knights Templars and hence the village name. Temple Grafton is known as one of the Shakespeare villages. Many people believe it to be the place where William Shakespeare married Anne Hathaway in 1582 and since records of the marriage do not appear in Stratford upon Avon, and it is known a licence was issued for them to marry in the parish church. However, marriage records for the period have been lost. There is another former place of worship in the village. To the east of the village on Church Bank there is the former Grade 2 Listed Baptist Chapel, built in 1864 on the site of a Moravian Chapel. It is now a private residence. Grafton Court is a Victorian stately mansion house that has been divided up to form luxury apartments. The size of the Old Vicarage in Temple Grafton shows the status that the parish church of St. Andrews once had. 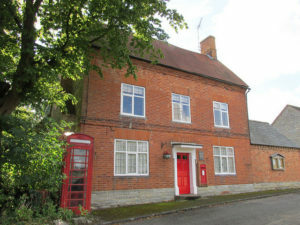 A building in the garden of the Old Vicarage was at one time the village Post Office, and the post box remains in the Rectory wall. In common with a lot of parishes in the post war period, the vast property was sold off, and a new smaller Rectory was built in the grounds of the old one. The last resident Rector retired towards the end of 2000 and since which time the ‘new’ rectory has also been sold. The Victorian built Temple Grafton Church of England Primary School is almost opposite St. Andrews Church. The Village Hall is in New Road and serves both Temple and Arden Grafton. There is a public house at Temple Grafton located roughly one quarter of a mile outside the village to the east. The oldest part of The Blue Boar Inn dates from the early 1600’s and it has been an Ale House since that time. It is possible to trace the names of all the individual landlords and their families since 1776 (see the photographs in the bar). There is a glass covered well in the restaurant bar, some 35ft deep and pure water from it in the past has been used in the brewing process. It is now home to a family of goldfish. Ardens Grafton is in one of Warwickshire’s Conservation Area’s, the main street being lined with groups of tiny stone or brick half-timbered cottages. The hamlet takes its name from ‘the farm by the valley’ and the view from the hilltop position stretches across the Avon Valley to the Cotswolds and to the Bredon Hills. The land rises to an altitude of over 300ft. Exhall lies on Hay Brook, a tributary of the River Alne. The hamlet is known as one of Shakespeare’s villages and was given the nickname of ‘Dodging Exhall’, which may have risen from the fact that the village was not, at any rate in the 18th century, directly approachable from either Alcester or Stratford upon Avon. The parish church is dedicated to St. Giles and is a small building with a Norman nave dating from the 12th century, a 13th century chancel, a south porch and a bell-turret. The church was much restored and in part rebuilt in 1862, mainly at the cost of the then Rector. However, the Worcester Diocesan Architectural Society protested in 1861 against the plans of the builder Soloman Hunt to remove the Norman doorway, the old windows and the original bell turret, and so the Church Building Society refused to make a Grant. Exhall Village Hall is a little further north and almost opposite the entrance driveway to the church. The former Victorian school which was originally built in 1878 has been extended and modernised and is now a private residence named The Old School House. Oversley Wood is managed by the Woodland Trust and is full of wildflowers, and in Spring-time is a carpet of bluebells, which covers the woodland floor. The wood is also a very good habitat for butterflies. There is a viewpoint at the highest point with views over to the north-west of Alcester. Oversley Castle is set in a prominent strategic position which has views across seven counties. A building on this site dates back to the time of King Offa, who ruled over the kingdom of Mercia from 757 AD until his death in July 796 AD. Offa’s Ley means Offa’s pasture and this was later transcribed as Oversley. The castellation of Oversley Castle, to make it an ‘eye-catcher’ when viewed from Ragley Hall is said to have resulted from a comment in 1818 from the Prince Rupert. In a Ragley Hall guidebook, the 8th Marquess of Hertford wrote; Oversley Castle was built in the early 1800’s because the Prince Rupert, looking out of his room one morning, remarked to his host, ‘My Dear Lord Hertford, your view would have been improved by a castle’. Accordingly, the so called Oversley Castle was built. After passing through a succession of owners Oversley Castle was bought in 2012 by a partnership that embarked upon the transformation of the house and the properties in the grounds into 14 unique luxury houses, yet retaining all of the original features. 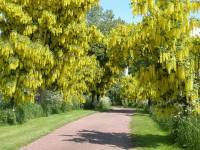 Walking down the driveway of Oversley Castle in Spring-time is a delight, as it is planted with Laburnum trees and looks glorious when in blossom. Wixford was originally ‘witlakesford’, then ‘wicklesford’, and by 1570 the village took its present name. Today, Wixford is a small hamlet close to the old Roman Road, named Icknield Street, and the River Arrow runs through the village. It is another of the Shakespeare villages in the Stratford upon Avon area and was termed by him as ‘Papist Wixford’. The reason for the village being described as papist may be a reference to the Catholic Throckmorton family, as in 1541 it passed to Sir George Throckmorton, in whose family it remained until 1919, and at which time the estate was sold and the manorial rights extinguished. The parish church is dedicated to St. Milburgas of Wenlock and was founded in the 12th century. The Doomsday Book of 1086 makes no reference of a priest living at Wixford, although the dedication of the church to the Saxon saint of St. Milburgas seems to suggest evidence of its datage. The church was restored in 1881 and probably the south porch and the western bell turret are of that date. There are two Norman doorways on the south side, both with columns. Inside the church there is a magnificent brass of Thomas de Crewe dating from 1411. For much of the late 19th and early 20th centuries, people travelled from Alcester to the Sunday evening service at St. Milburgas. The church is approached through a churchyard heavily shaded by an old Yew tree that is reported to have been planted in 1765. The churchyard also contains a Grade 2 Listed horse-house, made of hurdle and gorse with a thatched roof, and dating from the 17th century. Wixford never had its own separate clergy and was always a ‘chapel of ease’ to Exhall since the reformation, so provision was made to house the horse of the visiting clergy. There is also a fine, large base of a churchyard cross with a moulded top edge, the stump of a shaft, and the three steps to the platform, all dating from the 15th century. The small Village Hall can be found on the corner of Church Fields and the meeting with the main road through the village. The village has two public houses. The Three Horseshoes was originally a row of cottages and a blacksmith’s forge, and has been refurbished in a contemporary style, which is sympathetic to its classic features. 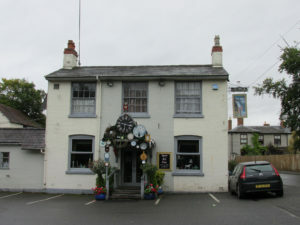 It is now part of the Inn Britain Chain. The Fish Inn is located on the edge of the village, and is set on the banks of the River Arrow. 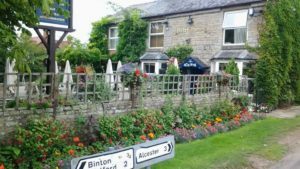 It is a wonderfully quirky riverside pub and is very hospitable to walkers. Car parking is available at The Fish Inn in return for support of the public house.